Today I wanted to take a look at a hi-tech piece of kit that is a great addition to any hikers toolbox. That piece of kit is the Suunto Ambit3 Peak Sapphire GPS Watch. Perfect for hiking, it’s uses also extend out to, more or less, all outdoor activities e.g. trail running, skiing, etc. The Ambit 3 is a clever GPS device that performs multiple functions. OK, that is a big one but we’ve got to start somewhere! From a hiking perspective the Ambit3 tracks speed, distance, elevation and time. 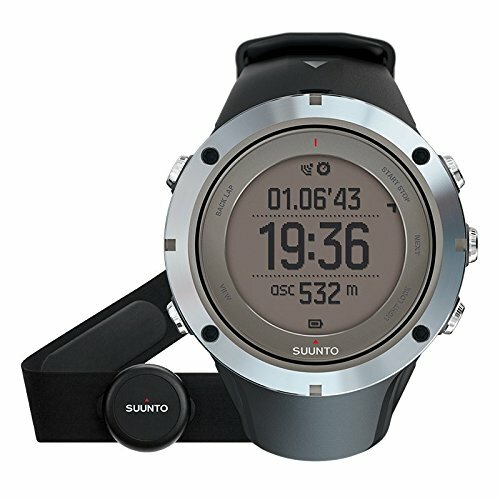 The speed and distance pieces of this are tracked via GPS while elevation is calculated via the Suunto Fused Alti™ which is a pressure and GPS based altimeter in the watch. Pretty cool stuff that gives very accurate data readings. The watch has the functional facility for route navigation via a built in compass and GPS. The watch connects to GPS / satellite to track your route and allows you to store up to 100 way points so you can easily trackback should you need to. It can also store up to 50 routes. This functionality is further extended in the accompanying software and apps e.g. sharing routes, etc. From my research into GPS watches one of the most common complaints is loss of connection. From all the reviews I read on the Ambit3 I didn’t hear any complaints in that area. It seems to be able to maintain full capability wherever you are on the hills and whatever speed you may be going at. Good to know. Weather data and sunrise and sunset times are always really useful to have when you’re out on the trail, especially for a multi day trek. These are available and can be displayed on the watch. While perfect for a longer trek, it’s also great should you need to keep an eye on when you need to make your way back to camp or to your car before the sun goes down. Handy to have for sure. The Ambit3 of course has the general standard watch functions like time, stopwatch, split timing, alarm and so on. It also has a back light should you need to view it in the dark. The watch can utilize multiple languages which is another neat addition to have. I can’t think of why I would want to use this capability but I guess it means that regardless of your native tongue, a few clicks of a button and you have the watch set to display in your language of choice. The Ambit3 Peak Sapphire has loads of other outdoor activity functions which although not directly related to hiking could surely come in useful for those more rugged adventurers on the trail. For example, the watch is water resistant up to 100 meters should you need to take a dip on a hot day on the trail. While this is built more for diving purposes, it will still come in useful should you need to get immersed swimming across a deep river. As I said, more for the rugged adventurer than the average hiker but nice to have all the same. This watch also has the capability to monitor heart rate. Everything from heart rate in beats per minute, % of max hr, heart rate limits, etc. there are a whole range of capabilities in this area available. The watch works with the various software and applications available to track all this data. I have never had a need for tracking my heart rate and so on but I do have some ultra running friends who do that kind of thing. It’s a very exact science they seem to work too, monitoring their heart rate to keep it at a steady pace and so on. Sounds very technical to me! I don’t know about people with heart problems, not an area I can really comment on but again, the ability to have heart rate limits should enable someone who needs to keep at a certain pace, stay within the correct limits. I imagine that is very powerful if you have heart issues. I am surmising though as I don’t much about that area. There is a lot of accompanying software and apps that Suunto provide to work with the watch. To touch on a few, data recorded can be used to provide analysis based on your heart rate, calories burned and so on. As mentioned above, heart rate isn’t something I have ever used but it would be interesting to learn more about, especially in relation to calories burned. I am no expert in that area but I guess you could probably get to a stage where you could pretty much know that doing x terrain and y speed will generate x heart rate burning y calories. I don’t know about you but to me that’s kind of mind boggling, the technology is just awesome, to think you can have that kind of data at your finger tips has got to be powerful in so many ways. Next up, there is a facility to download training plans, fitness tests and so on in the different areas of activity. The watch also enables you to save images and commentary against your training plan should you wish to keep note of performance, route identifiers and so on. I like this idea. You can do a fitness test and track all your key results. Then download a training plan and complete it. Following that, repeat the fitness test and match up the numbers. Again, really powerful information here. For me personally, I would probably just be using this for fun and interest, the more I read into this type of thing it strikes as elite athlete type stuff, bit the average hiker. However, it’s fun and the potential seems endless and with a range of outdoor sports supported, the range is very wide. Next we move to a movie making capability. Yes, there is also the facility to create a Movie of your hike route on a 3D map with key metrics and images. All of this can then be instantly uploaded and shared with your friends and fellow hikers. While there are plenty of free or cheap apps that do this kind of thing, like viewranger for example, this is a nice addition to have. The watch can also be synced with your smart phone via bluetooth so you can see the display. Pretty neat capability if you have your phone tucked away in your pack and someone gives you a call. You can see if it’s an emergency or not without having to go rooting into your pack for your phone. This watch is very flexible in that it is really more a multi-function and multi-sport watch, rather than just a hiking GPS watch. You can record multiple activity types within it. So if you’re into skiing, running as well as a day out on the trail, this one device will cover all your needs. I can’t say that I am expert in the area of GPS watches but I have been doing a lot of research into this area as I plan to replace a basic Garmin one I have soon. This one is top of the list! The Ambit3 Peak Sapphire has all the functionality I would expect in a GPS watch and then some. From a hiking perspective, with a really good GPS and trackback functionality as well as temperature and weather data, I think even a newbie could utilize the functionality of this hi-tech watch for the trail. The one slight concern I have with it, as I do most of my hiking in Europe, is availability of European maps on it. I couldn’t find an exact answer on that from my research so far so I’ll need to check into it more. I hope you found this look at the Suunto Ambit3 Peak Sapphire GPS watch useful. In truth, I have only touched on the surface of what this watch is capable of. For hiking purposes though, it ticks all the boxes, and then some, I would look for. Do you use the Suunto Ambit3 Peak Sapphire GPS watch? What are your thoughts on it? I’d love to hear about it in the comments below.